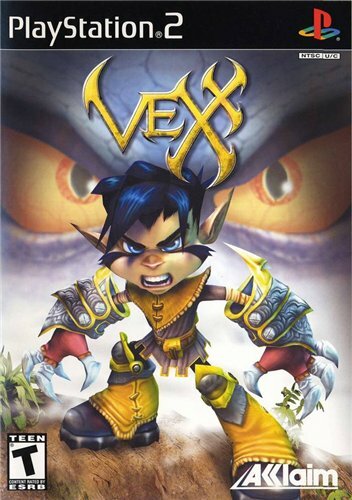 Anyway, one game I always thought had an immense sense of this mystery I so love was Vexx. This game just has so many unique locations that defied explanation, or at the very least, left the player wondering…what’s the story behind this? The tower behind the waterfall, the skeletal remains of a dragon, the former occupant of Tempest Peak Manor, not to mention the identity of the sages carved into the Summit of the Sages. The game never had a sequel as originally planned, as Acclaim was bought by someone else, leaving me with so many questions I’d like answered. Again, a fan fiction or several may be in order. I owe the world my very valued and interesting thoughts and opinions on this most pressing of matters. There are several mysteries, I found, that weren’t so very mysterious, however. One was a door in the Summit of the Sages. You can blast out of the mountain a giant carving of Vexx’s face and then go inside it to reach a truly creepy place. Inside, I specifically remember a tunnel of sorts, but what was really just a narrow hallway that felt like a tunnel, with a door at the end. I wondered so badly what was behind this (honestly, game developers, from now on, I suggest you include a mystery door that is never, ever opened in every game you make, and you’ll keep be guessing for all of eternity), and one day, I replayed the game, and you know what? This door was simply an obstacle to break with the power up that makes Vexx all strong-like. What a disappointment to find that this wasn’t a mystery door Acclaim had included just to make us wonder. It was actually there for a reason, which completely ruined it for me. I believe I put my plan into action on Dragonreach, and I got Vexx’s flying power up, and I started heading for the tower. I had a time limit before his wings would disappear, but I was coming so close. And then, I had reached the tower…and I flew right through it and died. So much for that mystery. It would have been really cool if they had allowed players to reach this place as a fun secret level, but alas, Acclaim took the lazy way out and didn’t bother to actually make it solid. It just goes to show…well, read this post’s title. That’ll tell you all you need to know. Previous Post What Will The FFVII Remake Look Like?